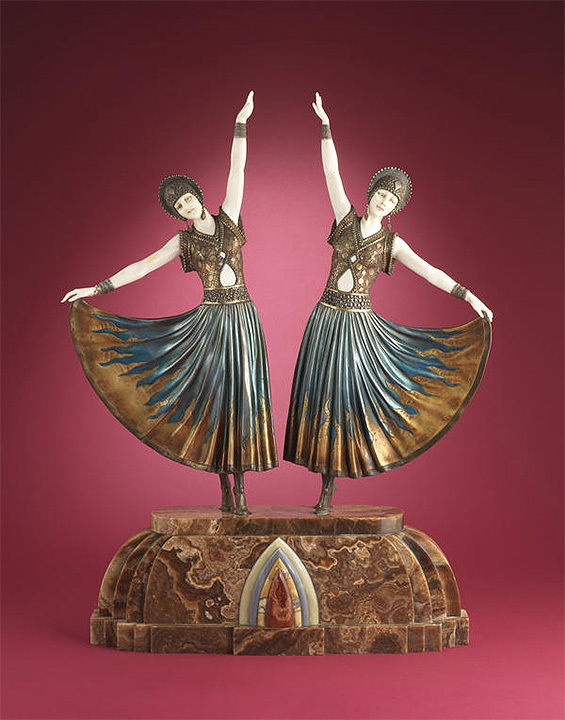 Christie’s Paris held its 20th Century auction, Arts Décoratifs Du XXe Siècle & Design on November 21, 2012. Sales were strong, with many items far exceeding their high estimates. Total sales were €7,174,525 ($9,301,876). 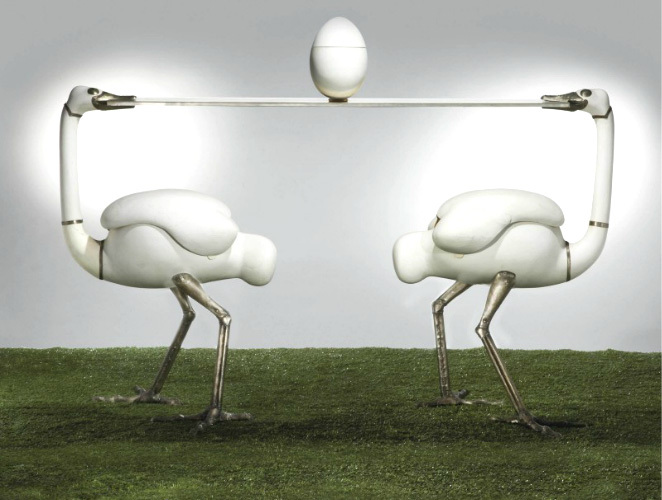 The top lot of the sale, #105, was a bar entitled Les Autruches (The Ostriches) from 1966 by François-Xavier Lalanne and the Manufacture Nationale de Sèvres. Made of biscuitware, silvered metal, steel, iron and silver, it stood 47¼” high by 76¼” long. Estimated to sell for €200,000 – €300,000, it more than quadrupled its high estimate to realize €1,465,000 ($1,869,787), including buyer’s premium. Sales of items by Diego Giacometti were received well, as usual. 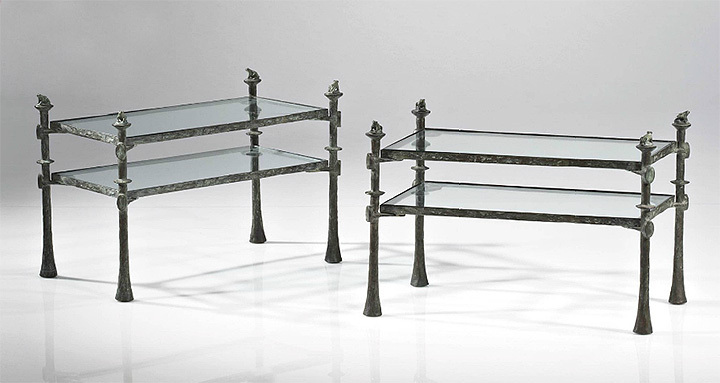 Lot #72 was a pair of bronze tables with green patina. The result of €331,000 ($422,457) doubled the high estimate of €150,000. Another table, lot #74, tripled its high estimate of €90,000 to sell for €313,000 ($399,484). For the complete results of the sale, click on the following link. Christie’s Paris 20th Century results. 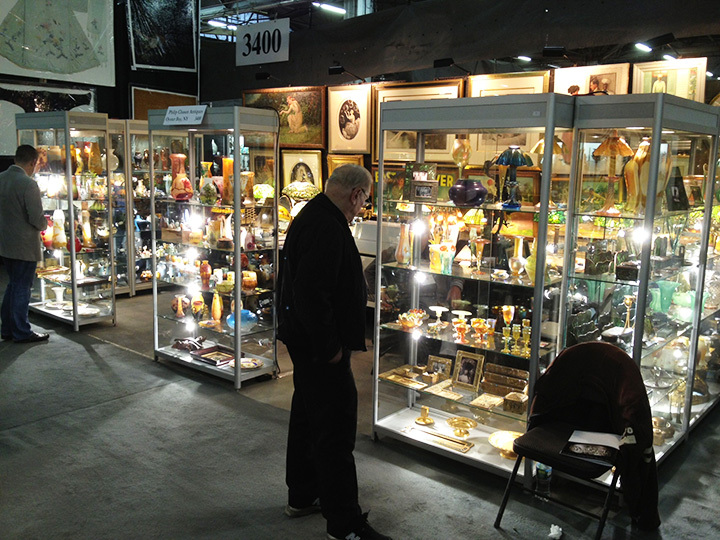 No more shows in 2012, so we’ll be spending the time buying treasures for the 2013 antiques season which begins with the Birchwood Manor Antiques Show in Whippany, New Jersey, January 5-6, 2013. (We might also find a little time for R&R.) After that we’ll be traveling south for the important Miami shows in late January and early February. In the meantime, we’re still in business, so keep the inquiries coming. Let me know what you’d like to buy, sell or trade. If you need a Christmas present, NOW is the time. I’ll be adding many new items to my website this week. I will be posting videos on YouTube of my lecture on French Cameo Glass to the Metropolitan Glass Club. Right now my son Billy is creating the videos. When they’re ready, I’ll put the link on my website and here in my blog. Monday’s blog will be posted by 1 PM. First I’d like to wish everyone a Happy Thanksgiving! It’s a wonderful holiday, so enjoy it with your family and friends. 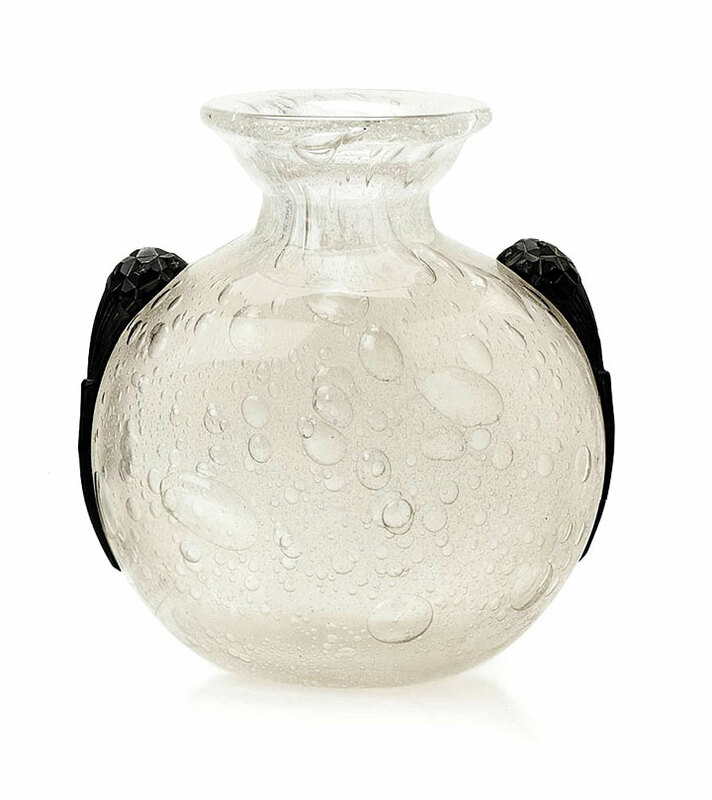 David Rago held a 20th/21st Century Design Auction on October 26-27, 2012, with some results for the history books. 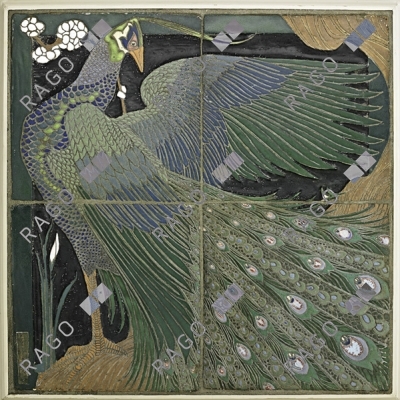 Most incredible of all was a Frederick Hurten Rhead four-part tile panel, 20¾” sq., given as a personal gift to Levi Burgess of the Weller Pottery. Estimated to sell for $35,000 – $45,000, it soared to $637,500. A hit-the-jackpot price for the consignor and a record for ANY piece of American Arts and Crafts at auction, ever. 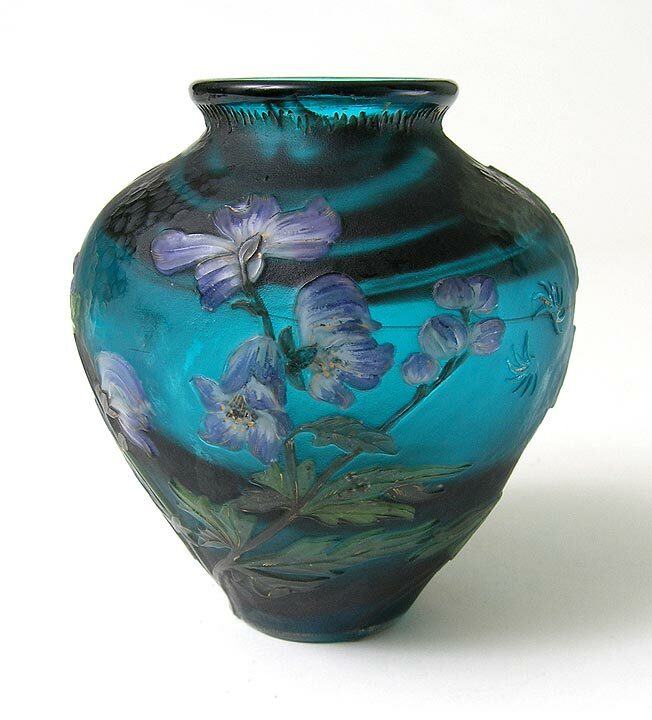 A wonderful Tiffany Studios Favrile glass, wheel-carved, floriform vase was the second best performer of the sale. Selling as lot #932, it realized a stunning final price of $100,000 — almost 20 times the low estimate, including buyer’s premium. What’s even more amazing is that the consignor, a dealer, bought the vase at a country auction two months ago for $75. Now there’s a story he’ll be able to tell his grandchildren! 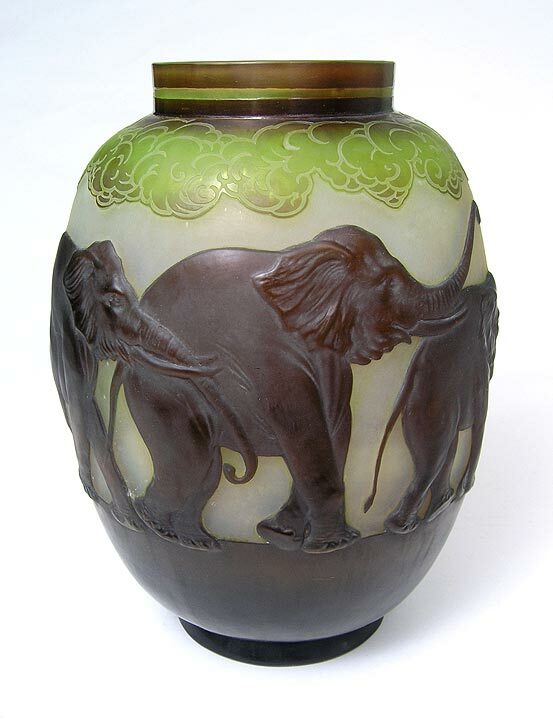 The second-best Tiffany lot of the sale was a pottery vase with milkweed design, with a few minor flaws. 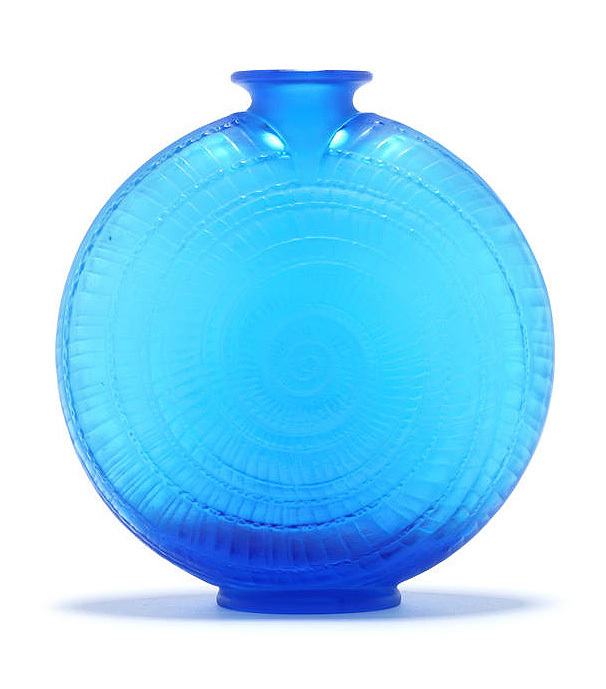 Tiffany pottery vases are rarer than glass vases and those with organic designs tend to be the most desirable, so it shouldn’t have been a surprise when it more than tripled its low estimate, selling for $42,500, against a pre-sale estimate of $12,500 – $17,500. But as amazing as the Tiffany floriform vase, this vase was rescued from a New York State home about to be demolished. It was saved from the trash and free. Kudos to the consignor! For the complete results of the sale, click on the following link. Rago 20th/21st Century Design results. First a final update on Hurricane Sandy. We got power back 13 days after the storm hit and we got TV, Internet and land telephone back 18 days after the storm. Then we were introduced to irony. While everyone was dealing with no power, we had power from our generator. While some were dealing with flooding, we were dry. Three days ago the heat and hot water magically stopped working. I called the oil company for service, but they were so busy they couldn’t come until the next day. So we went one night without heat. The next day, the serviceman came to fix the problem. As soon as he left, a pipe from the hot water heater burst, causing a major flood in the basement. Servicemen (plural) returned a few hours later to fix the problem, but then we needed a “dryout” crew to clean and dry the basement (paid for by the oil company). So while everyone was dealing with heat, we had none. While everyone was dealing with a dry basement, we had a wet one. If that isn’t the definition of irony, I don’t know what is. The good news is that everything is returning to normal and normal feels great. Back to business. 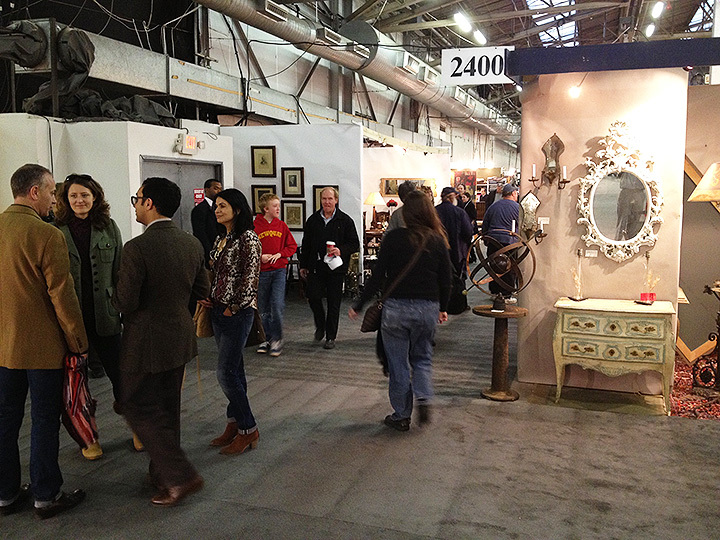 The NYC Pier Antiques Show ended yesterday, November 18, 2012. In asking around, most dealers told me they only had fair shows, but there was a wide range of opinions. Two dealers told me they had the best shows ever at the Pier. Another told me he only made one sale, and that was to me, pre-show — not a single item sold to the public. Ugh! Another dealer described his show in one word — “terrible”. There’s always a normal distribution curve of dealer results, but this time it was skewed a little toward disappointing. Some sales were strong at the show, including Handel and Pairpoint lamps — a welcome change. Personally, my show was moderately good, but less than the previous two shows. It could get better if sales develop later this week, as suggested by several clients. Sales and interest were best in French cameo glass (Daum and Le Verre Francais), Tiffany glass, a Pairpoint puffy lamp and a good painting. Attendance was good on Saturday, and almost as good on Sunday, but sales and interest were better for me on Sunday. Brooke Shields, Justin Timberlake, and Joan Rivers visited the show. (I’m a sucker for celebrities. I think I inherited it from my mother.) The problem was they didn’t come to my booth and buy anything. What’s wrong with them? We were viewing the important original Tiffany Studios decorations in St. Michael’s Church prior to my lecture on French Cameo Glass. 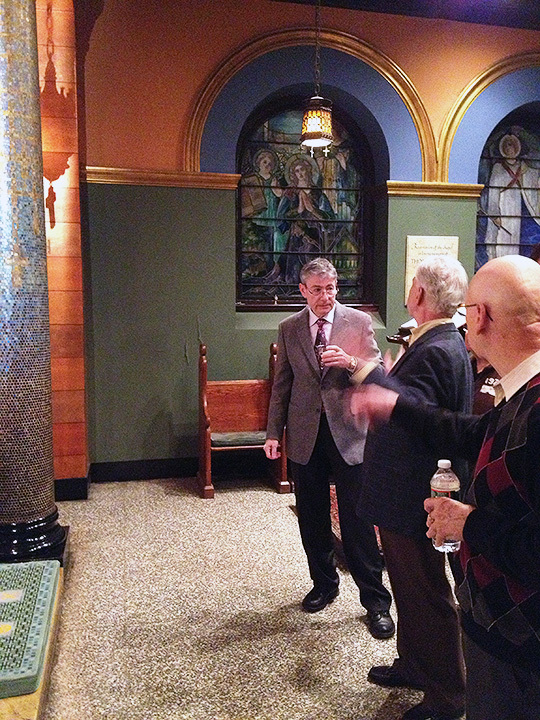 If you missed my lecture on French Cameo Glass this past Tuesday at St. Michael’s Church, you missed a good one. But fear not, because my son, Billy, recorded my lecture and is working on combining it with my PowerPoint presentation. When it’s done, it will be posted on YouTube in sections. My lecture started with the basics and continued to the most advanced techniques. It will be important reference material for anyone interested in French cameo glass. 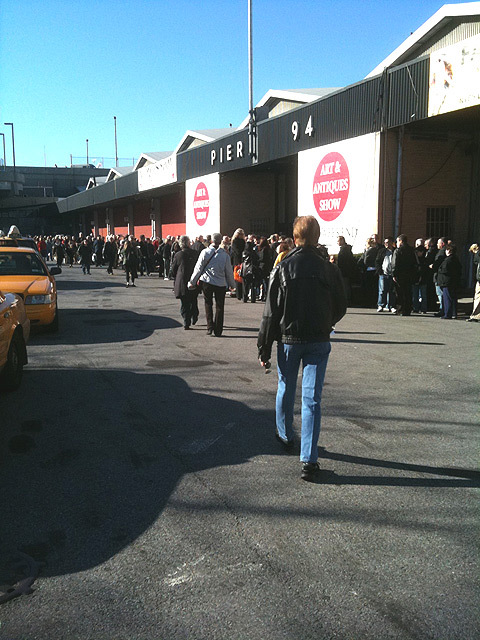 The NYC Pier Antiques Show opens this Saturday, November 17, 2011, at 10 AM and continues until Sunday, November 18, 2012, at 6 PM. There was some concern after Hurricane Sandy that the show might have to be cancelled or postponed, but the Pier was put back into shape quickly, so the show will go on (a New York Broadway tradition!). Stella Show Management did a great job making sure everything was set. Because the show is only two days long, it’s more intense than many longer shows. There’s more action because people have to make up their minds faster, or the items they were considering may be gone. The selection of items for sale is very eclectic, from silver, jewelry, Asian, ceramics, art, and vintage clothing to glass and lamps (me and several other dealers). The show is so important that many buyers fly in from all over the world, including as far away as Japan. My booth is near the entrance, so you can’t miss me. I’m bringing an incredible selection of fresh merchandise, including wonderful French cameo glass, Tiffany glass and lamps and much more. You will enjoy the show, so make your plans, even if they’re last minute. The Big Apple awaits you! Click this link to view some of the new objects I recently purchased. I recently listed over 25 new items. 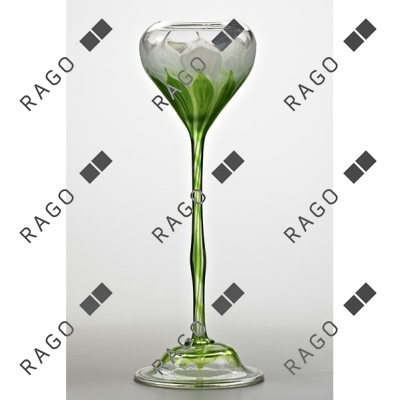 French glass for sale. We always strive to offer the finest objects for sale on our website and at every show. First a storm update. Things are looking up. 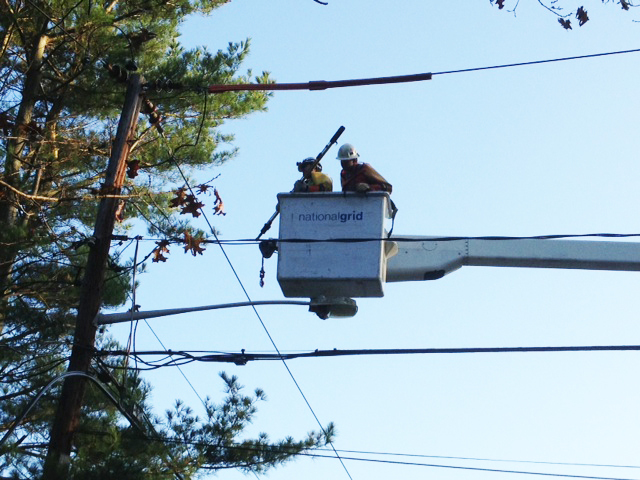 Power was restored today to my neighborhood — 12 days after the storm. Hallelujah! We still have no Internet, TV, or land phones (and that could take up to two months to restore). Many gas stations have no lines, but an odd-even system is in place, so it can only be bought every other day. All in all, though, the situation is vastly improved. Back to business. 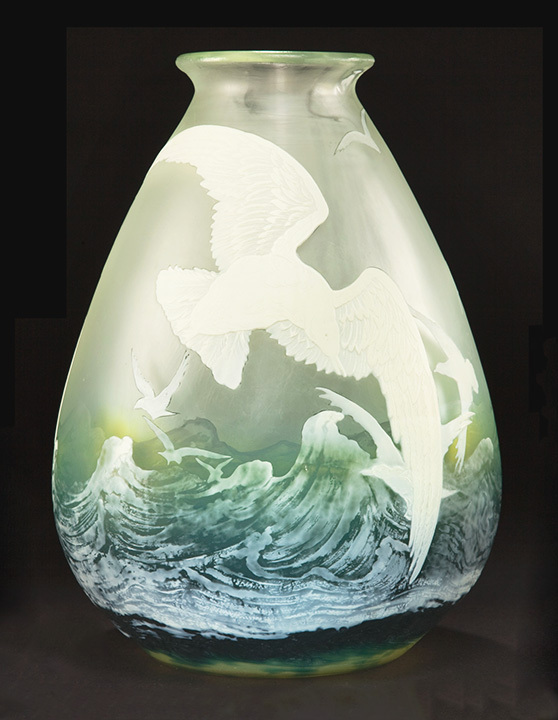 I’ve been invited by the Metropolitan Glass Club to lecture about French Cameo Glass. The lecture will be held at St. Michael’s Church on W. 99th St. between Broadway and Amsterdam Avenue in New York City at 7:00 PM, this Tuesday, November 13, 2012. Wine and cheese will be served at 6:30 PM. All are invited. My lecture is entitled French Cameo Glass: A-Z. I can’t say I’m thrilled with the title, but I am thrilled about the lecture. I spent an inordinate amount of time creating a Powerpoint presentation with lots of photos. The lecture will cover everything from the very basics of French Cameo Glass to advanced techniques, including sections on determining value and spotting reproductions. There will be things you’ll learn, even if you know quite a bit already. Hope to see you there. In the meantime, the news is good about the NYC Pier Antiques Show. Pier 94 has power and heat and is dry. The show will go on as planned this coming weekend, Saturday and Sunday, November 17-18. It will begin on Saturday at 10 AM and continue through Sunday at 6 PM. You should make every effort to come because it will be a good one. They always are! 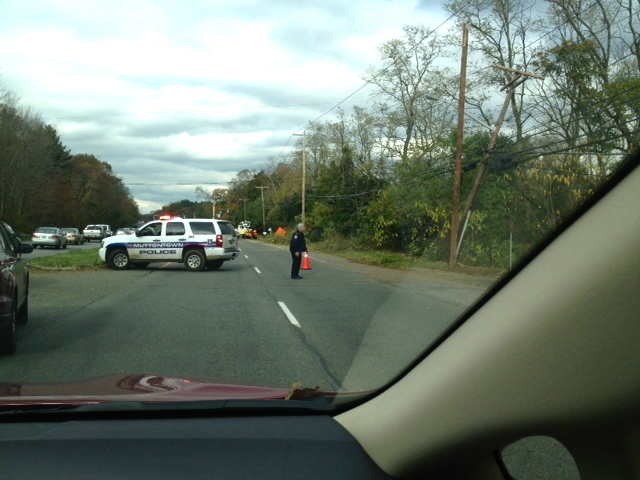 I’ve been so preoccupied with the aftermath of Hurricane Sandy, that I haven’t had time to focus on business. Before I get to that, here’s a brief update. As of Wednesday night, we haven’t had power in my neighborhood for nine days (and none is expected until Monday, November 12th). 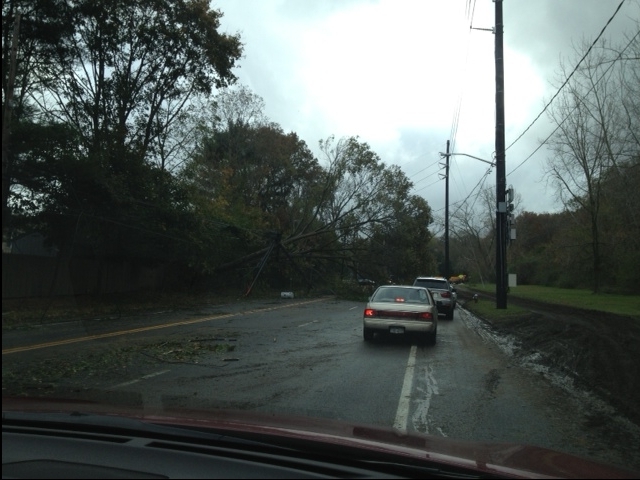 LIPA (Long Island Power Authority) says that over 140,000 homes are still without power. We’re in the middle of another storm right this minute, which will probably cause more damage. Gas lines are getting longer, not shorter. It’s been pretty tough here for many people. Back to business. Christie’s New York held a successful two-day 500 Years Decorative Arts Europe auction on October 17-18, 2012, with gross sales of $4,280,225. Included in the sale was a fantastic one-owner collection of French cameo glass, much of which was purchased as recently as one year ago at auctions in New York City. I find it curious that the collection was for sale so soon after purchasing some of it. Since I believe the owner(s) are still alive, my best guess is that the collection was sold as part of a divorce (but that’s wild speculation on my part). 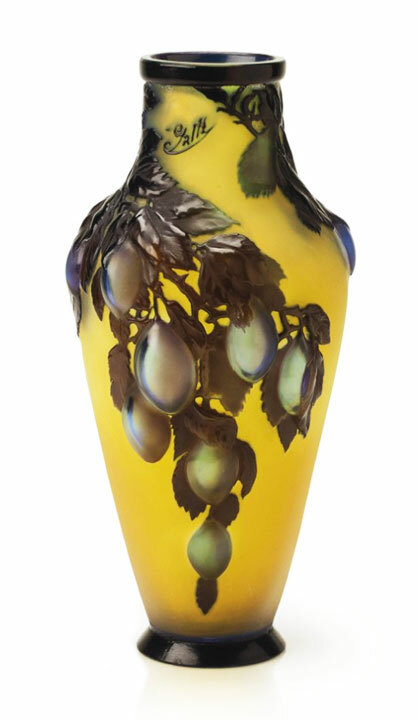 The top French cameo glass lot of the sale was #326, a rare, large Gallé vase with parrot decoration. Estimated to sell for $40,000 – $60,000, it realized $47,500, including buyer’s premium, toward the low end. Most of the vases in the sale had low estimates, but not this one. I imagine it was because the buyer paid a record price for it at Christie’s December 8, 2009 auction, where it sold for an astonishing $104,500. $47,500 was a much more realistic price. Here’s the link to my original blog about the sale. December 9, 2009 blog. 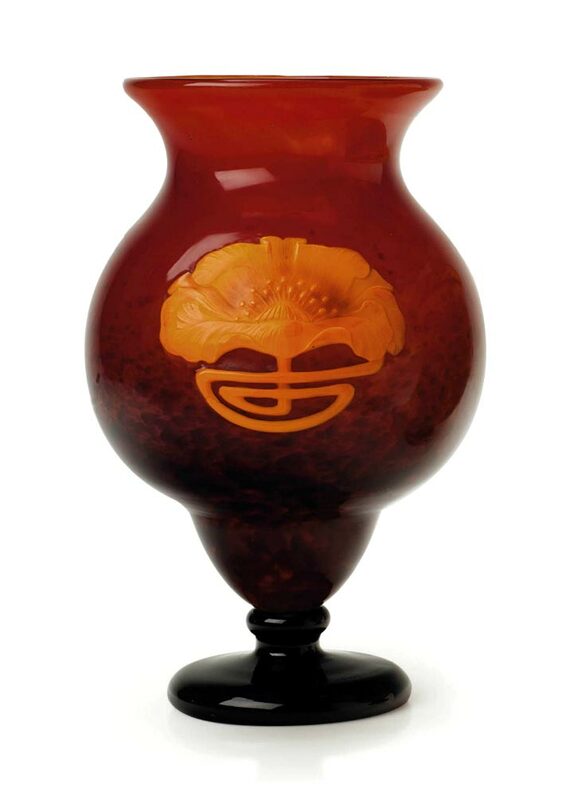 The second best-selling French cameo glass vase was a truly gorgeous fall scenic by Daum, sold as lot #325. Most Daum fall scenics are beautiful, but this one was both exceptional and large (18½”). It sold for $26,500, against a pre-sale estimate of $7,000 – $9,000 — over triple the low estimate. 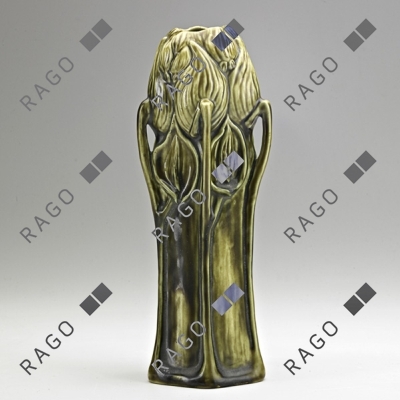 I really wanted to buy this vase, but the price was too strong for a dealer. Another Daum fall scenic vase, lot #324, almost as nice, sold for $25,000. 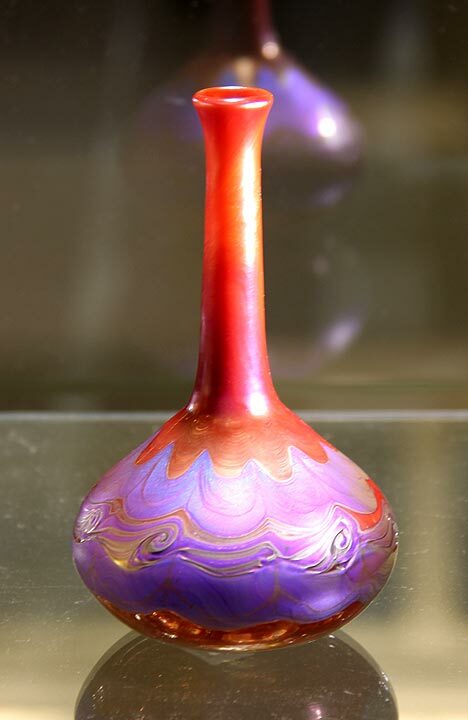 A very attractive Gallé mold-blown plum vase, lot #347, was the fourth strongest French cameo glass lot of the sale. Against an estimate of $5,000 – $7,000, it sold for $21,250 — too rich for a dealer, but not for a collector. For the complete results of the sale, click on the following link. 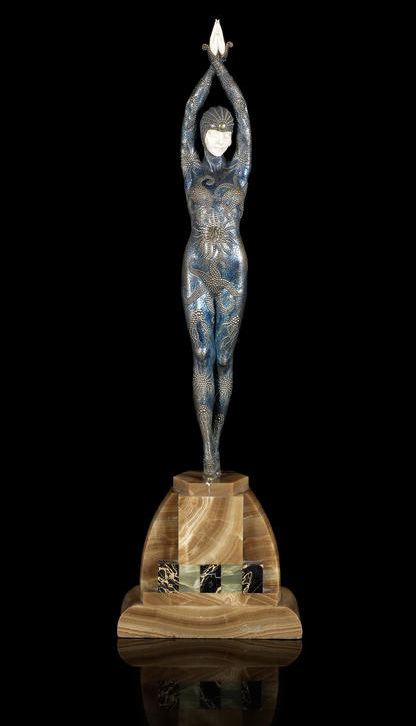 Christie’s 500 Years Decorative Arts Europe results. 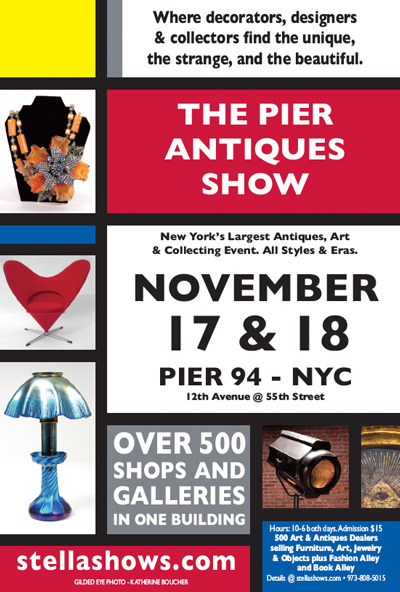 The big, important NYC Pier Antiques Show is coming next weekend, November 17th-18th. If you haven’t made your travel plans yet, there’s still time. This is one show you shouldn’t miss. You can knock off two birds with one stone — see the show and enjoy the Big Apple! It’s Sunday night as I write this blog. Tomorrow will be the seventh day without electricity for my neighborhood. 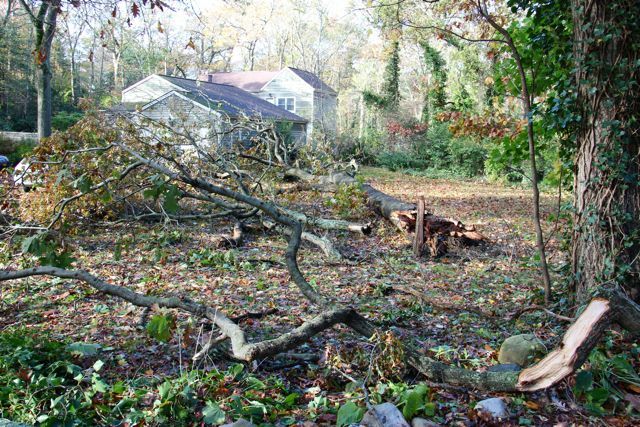 My timing on installing a generator was impeccable, just before Hurricane Irene hit last year. I wish my timing on buying and selling stocks were as good. Last year we were without electricity for three days. Seems like a piece of cake now. There’s a possibility we won’t have electricity for another week. Then there’s no TV (did the NY Giants win or lose?) or Internet, as well as telephones because they’re connected to the Internet. We have been able to get Internet through a Verizon MiFi device and our cell phones are working now. 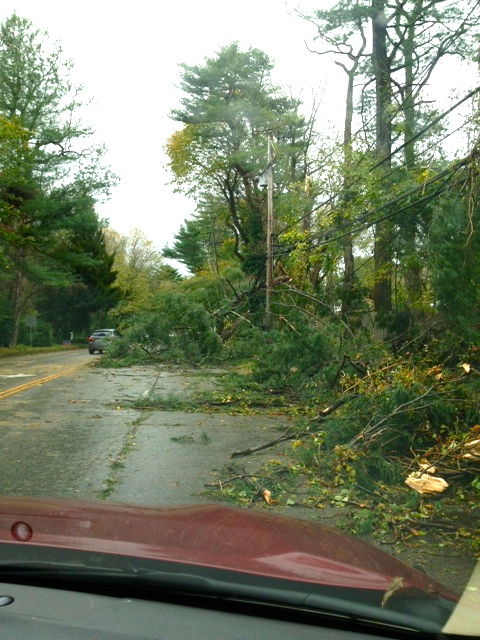 Progress seems to be slow, but there were so many trees and power lines down, that it doesn’t surprise me. I really can’t imagine what it’s like in those homes that still have no electricity or heat. It’s been getting colder, so it’s getting more difficult each day. People lost all of the food in their refrigerators and freezers. Barbecuing has been the source of hot food for most people with no power. Restaurants that are open are doing brisk business. Gas lines are getting longer each day. People are waiting 1-4 hours at stations that have 30-50 cars, or more, on line. 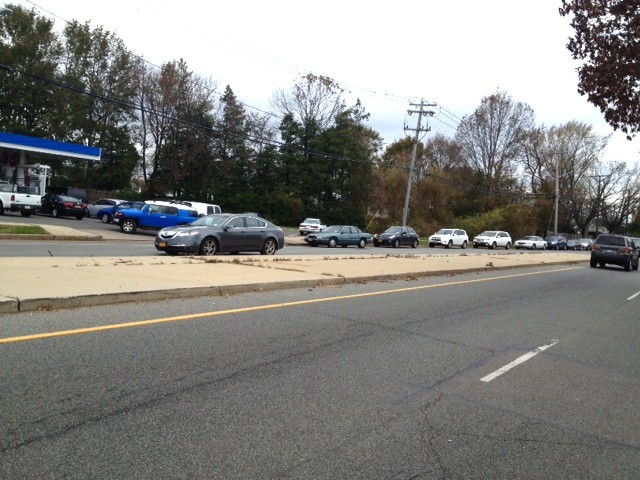 There are also big lines of people at gas stations, all with one or more gas cans. I think most of those people are powering portable generators. The problem seems to be two-fold — stations with gas have no electricity so they can’t pump OR stations can’t get gasoline. It’s a big mess that shouldn’t last too much longer, but it’s quite the problem now. I spoke to one man who just got his power back. He had an ear to ear grin — he was so grateful. Makes you appreciate things that are easy to take for granted, like power. May I suggest to you to go out and buy a generator? I installed mine before I had any idea that we would have consecutive year major hurricanes. For the previous 16 years, we haven’t been without power for over 24 hours, and that was only twice. It doesn’t matter where you live. The weather is getting worse each year as a result of global warming and other natural disasters seem to be coming stronger and more often. You could be next. In the meantime, I’m getting ready for the big NYC Pier Antiques Show that’s coming up very soon the weekend of November 17th-18th. It’s unbelievable how much great new merchandise I’ve bought recently and I’m going on another buying trip this week. (So there won’t be a Thursday blog this week.) Make your travel plans now for the show. The power is almost 100% on in Manhattan. The city will be humming by showtime. Visit the city — see the show and have a grand old time in New York!! 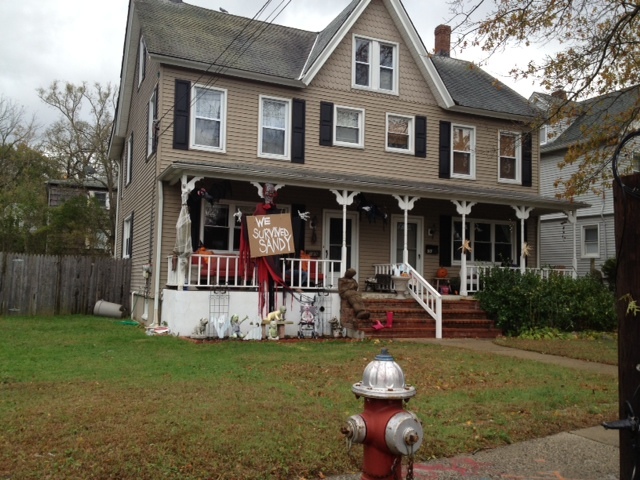 I didn’t know what to expect when Hurricane Sandy hit. In my mind, there would be the usual wind and lots of rain. My main concern was water infiltration into my house, especially into the basement. 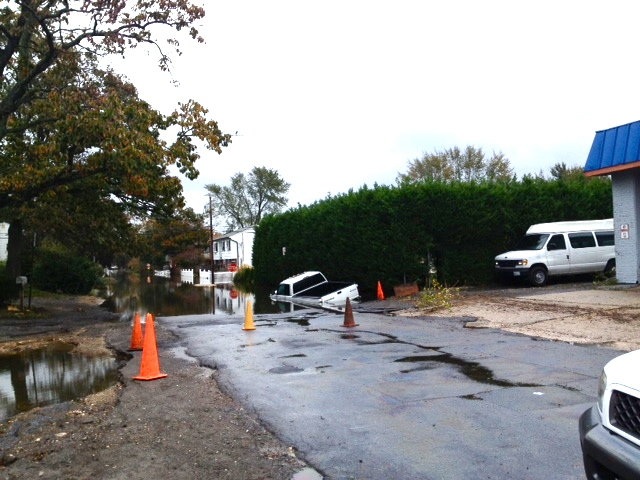 I was especially concerned about my daughter and her family, who live one block away from Long Island Sound, where the storm surge was estimated to be up to 15 feet. My daughter’s house is 12 feet over sea level, so the danger was real. I had visions of Hurricane Katrina with people being rescued by helicopter from their rooftops. My daughter didn’t think the danger was that serious, so at first she decided to stay in her own house. On Monday, just before the storm hit, occupants of her town were told to evacuate if they lived below 15 feet. So she packed up her family and came to stay with us. We’re more inland and have a backup generator. She also has a backup generator, but it’s brand new, in a crate, in her driveway. The electrician never got around to installing it on time. At first the storm didn’t seem too bad. There was some rain, but not anywhere near the amounts predicted. However, the wind predictions turned out to be more than accurate. My whole family huddled together while we listened to the wind howling. Once, we heard a big crack as a tree snapped and fell. We were having a party and felt safe in the house. We also didn’t want to scare our 3-year old grandchild. So we went to sleep thinking everything was fine. When we awoke, the storm had pretty much passed, so we were able to go outside and survey the damage. What a scene! Our very large front yard was completely covered by a huge oak tree that had snapped. It came right up to the house and the parked cars in the driveway without scratching a thing. Out back, another huge oak had snapped off into the forest. Next to it, another one was leaning at a dangerous angle as it had been uprooted. Also out back, still another large oak had snapped off. We really dodged a bullet on this storm. Several huge trees down and no damage whatsoever to family and home. Thank goodness!!! As we got to drive around, the devastation became apparent. 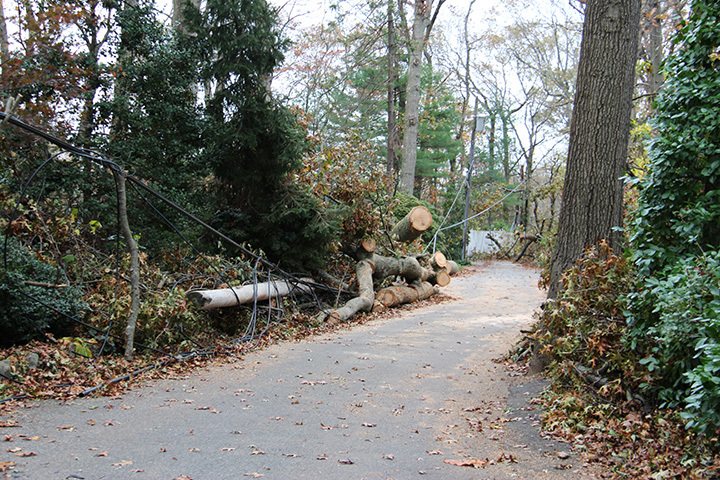 A tremendous number of trees had fallen onto power lines and utility poles, snapping them like toothpicks. 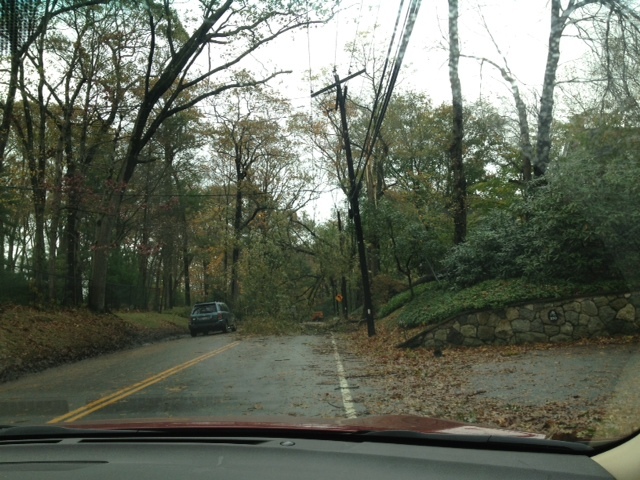 It’s Wednesday night as I write this blog, and it looks likely that power crews won’t be able to restore power to my neighborhood for another 3-5 days. We’re the only ones in our neighborhood with a generator. I thought more people would have purchased one since Hurricane Irene hit last year. Now I think there’s going to be a run on generators on the entire East Coast. Go out and buy some Generac stock. They’re going to be raking it in for some time. So as I write this blog, here’s the latest for our neighborhood — no electricity, no telephone, no Internet, no local restaurants, no banks, no gasoline (because the pumps can’t pump without electricity). The supermarkets are open because most of them have generators. We’ve got electricity because of our generator and Internet because we have a Verizon MiFi hotspot that started working today. As for my daughter, things are looking good too. It took some time to wend our way through the back roads to her house as most roads were partially blocked by downed trees and power lines. Thankfully her house and property were unscathed. 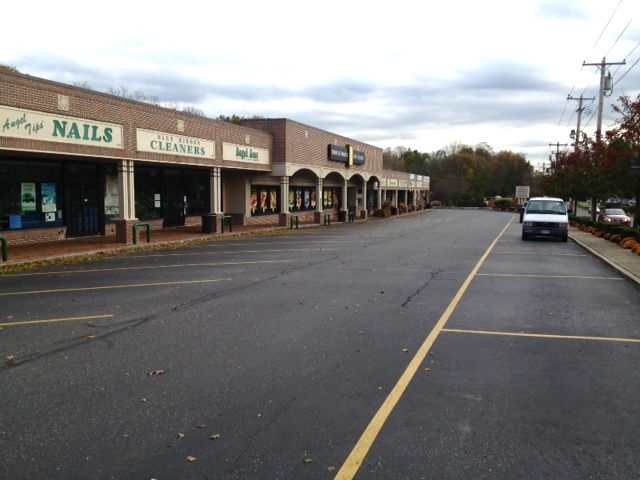 Some of the homes and businesses closer to the water didn’t fare as well. It really makes you appreciate what you’re missing. It’s easy to take services for granted, until they’re gone. Now it will be sweet just to get back to normal.